This 5 day mini-cruise plows through the most beautiful season of the year and will take you to gorgeous areas such in "the Garden of Amsterdam". Enjoy some unforgettable days on board of a passenger barge with excellent service and an alternating itinerary. Amsterdam is also called, by some, the smallest metropolis of Europe. There are many unique museums, enticing shopping and, recently added to the UNESCO Cultural World Heritage list, the canals in the heart of Amsterdam certainly make a visit to Amsterdam a highlight. Visit the famous flower market in the center of the capital and discover the "Zaanse Schans" open air museum including windmills, a traditional cheese maker, a clog maker and an authentic traditional Dutch village. Other highlights of this trip are the historic city of Haarlem, the world famous flower park "Keukenhof" near Lisse and the largest flower auction in the world in Aalsmeer. Flat, asphalted bike paths and side roads. Individual arrival. Embarkation between 2 p.m. and 4 p.m. in the centre of Amsterdam. You will start with a short "dinner cruise" to Zaandam, famous for its windmills and cheese making where your barge will berth in the centre of the city. In the evening enjoy a short walk through the picturesque centre of Zaandam. After breakfast you will enjoy a 5 km bicycle ride to the open air museum "Zaanse Schans" (entry incl.) with beautiful windmills, traditional wooden houses, an old Dutch village, a cheese farm and a traditional wooden clog maker. In the afternoon after returning to your ship by bicycle, you have a choice to make: you can either cycle (approx. 22 km/13 mi.) to Haarlem or take it easy while enjoying the scenery as your barge makes the approx. 2,5 hour trip. In Haarlem visit the historical inner city with the Grote Markt, St. Bavo church and the Teylers and Frans Hals-Museums. Your barge will be berthed in the center of Haarlem for the night, so you will have plenty of time to enjoy a short city walk in the afternoon or in the evening. Today you will cycle to the Keukenhof, arguably the most famous flower park in the world where you can admire hundreds of thousands of tulips, daffodils, hyacinths and many other flowers in full bloom. After an extensive visit, you will get back on your bicycle at noon and will head to Oude Wetering, a small village, where your floating hotel will be waiting for you. Entry Keukenhof: approx. € 18. This morning you are in for a real treat – an early visit by bus (06:30 a.m.) to the biggest flower auction in the world at Aalsmeer (not open in weekends and public holidays*). Early in the morning millions of flowers are auctioned off here and are instantly sent out to all parts of the world. By 09:00 a.m. you will return on the your barge in Oude Wetering where a late breakfast will be waiting for you before you make your way to Amsterdam on board the barge. During the afternoon and evening you either have the opportunity to make a last beautiful cycling tour through the wetlands of Waterland or to discover this amazing city. Visit the inner city flower market, go to a museum, do some shopping… there is just so much to do! Optional: end-of-day canal tour in Amsterdam. Entry flower auction: approx. € 7. Canal tour Amsterdam approx. € 10. * The Aalsmeer flower auction is not open in weekends and on public holidays. For this reason, for tours where such a visit is scheduled for a weekend or holiday, we will change the order of the program slightly and offer the visit of the flower auction on a weekday instead: this way, for each departure date, all highlights can be included. Disembarkation after breakfast until 9.30 a.m. Individual departure. After consultation with the crew it may be possible to leave your luggage on board until approx. 3.30 p.m. to give you more time to explore the beautiful city of Amsterdam. Docking place is only a free ferry trip from the central railway station. Departure is every 6 minutes. You will find detailed information in your travel documents. A monitored parking directly at the main station (only for cars up to 2,10 m height). The discount price (as per 2014) is approx. € 13 for 24 hours. approx. € 90-100 / week . Please plan your journey accordingly to be on time for embarkation between 2 p.m. and 4 p.m. Thank you for your understanding, that it is not possible to go on board before embarkation started. Your ship during the Holland & Belgium tour will be the MV Fluvius, MV Magnifique I, MV Magnifique II or MV Magnifique III. The MV MAGNIFIQUE III was built in 2017 and completed by March 2018. All elegant 21 cabins for max. 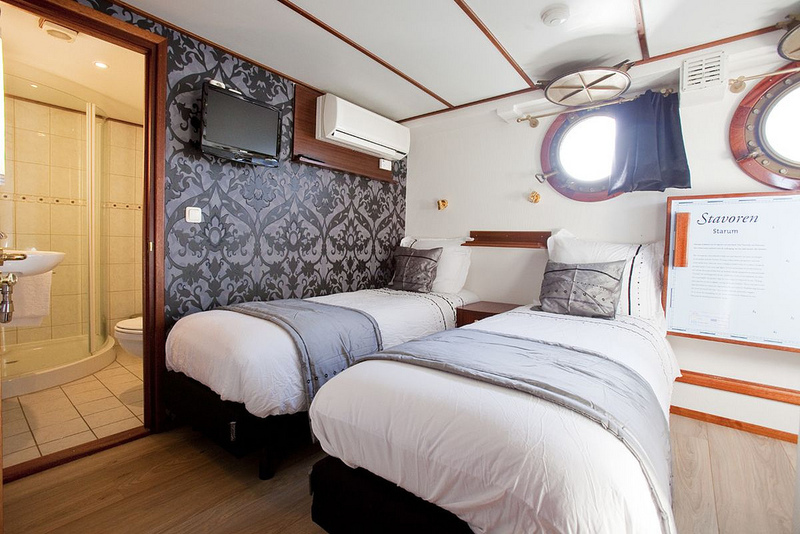 40 guests have portholes , shower + toilet, individually regulated air conditioning, flat screen TV with SAT-reception. Sundeck with jacuzzi. 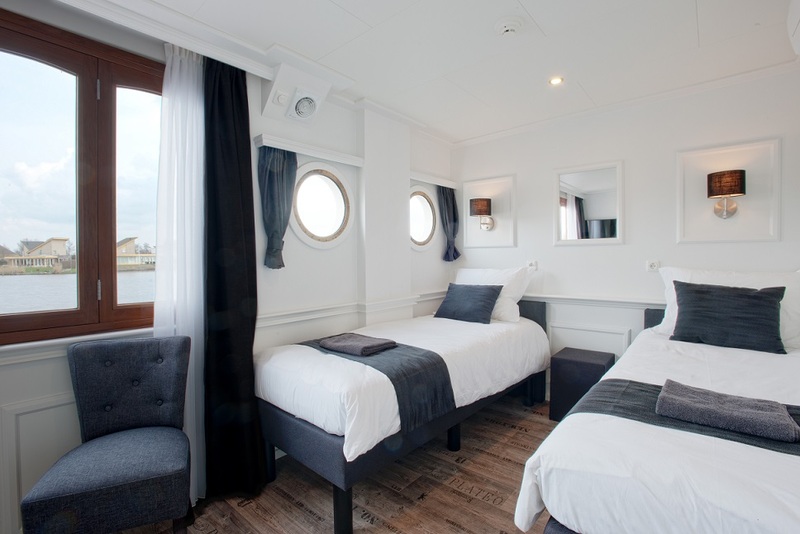 The MV MAGNIFIQUE II was built between May 2015 and February 2016 and has space for about 35 clients in 14 cabins, a tastefully furnished salon with restaurant, bar, lounge, two sun decks and a jacuzzi and a barbecue place. 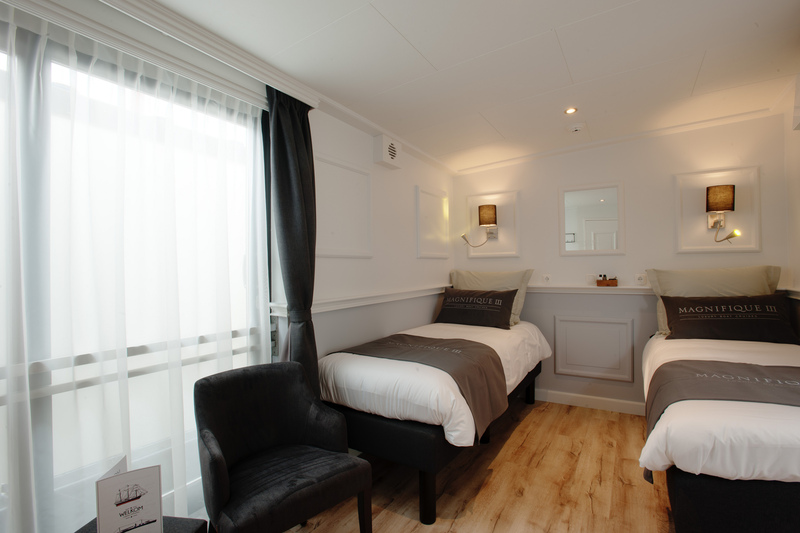 The MV MAGNIFIQUE I was completely modernized in 2010 and has 17 cabins für max. 35 guests, a tastefully furnished salon, two sun decks, a jacuzzi and a barbecue place. 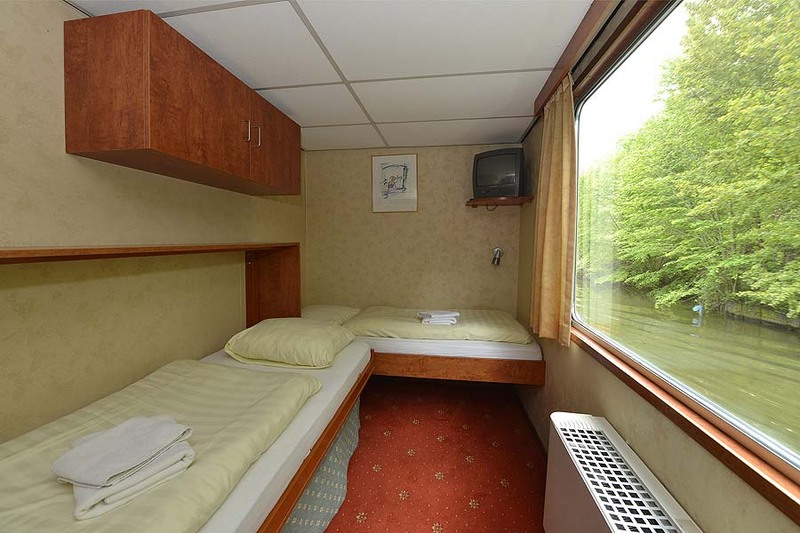 The small, comfortable and very popular river cruiser MV FLUVIUS with a comfortable salon has 22 cabins for max. 44 guests and a large sun deck.